Florida man says that by following scriptures from the bible, he was able to beat Chrones Disease. 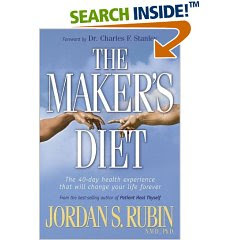 Jordan Rubin who now lives in Florida and the author of "The Makers Diet" says that out of the many thousands of diet books being printed every year, the oldest one is the the best. He goes on to say that by eating "whole, living and nutrient-rich foods" that are described in the bible he was able to overcome Chrones disease. Almost a decade ago the doctors told Jordan that his chrones disease was incurable, but according to him, he has manage to beat his disease after researching the Bible's "4,000-year-old health plan." It must be noted that he has used these ideas to found a health company, Garden of Life Inc. So has Jordan Rubin rediscovered something that has been missed by modern Western medicine? Or is he just using conventional wisdom by not eating pork and red meat and eating plenty of natural foods?